EVENT: SAT. 19th OCT. ‘EVERYDAY PEOPLE’ feat. DJs SAYWHUT, CMAN & JUZZLIKEDAT @ TATLER | SOUL OF SYDNEY FEEL-GOOD FUNK SOUL DISCO vibes & beyond. HERE WE GO! 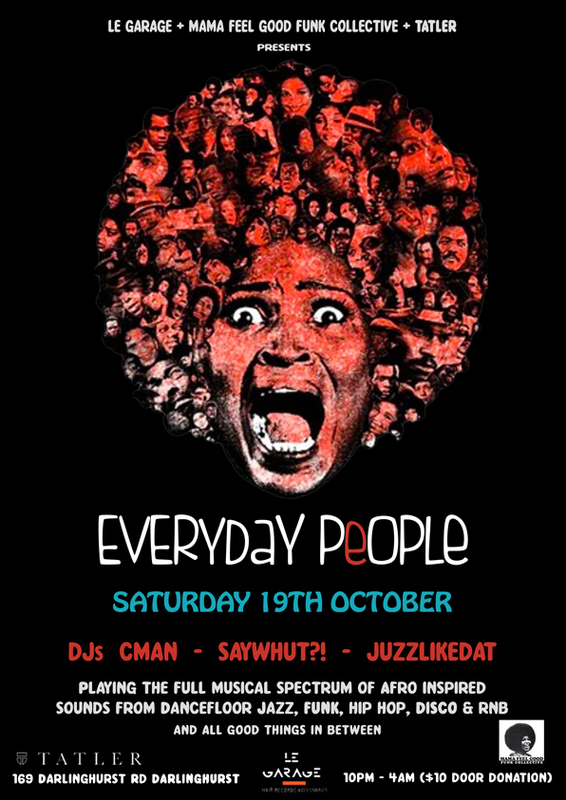 4 more days folks till #EVERYDAYPEOPLE @ #Tatlers on Saturday 19th October – featuring special guest DJ SAYWHUT alongside original SOUL OF SYDNEY block party rockers DJs CMAN & JUZZLIKEDAT. Music policy? Wicked tunes covering the full spectrum of Afro inspired sounds. It’s a full circle round trip Afro excursion from dancefloor jazz, funk, hip hop, to disco and R&B (the good kind!). Save this date funksters, this is gonna be an all out cut-the-rugg kinda paaartay till laate! EVERYDAY PEOPLE, unifying folks under a common theme of music with soul, and a love of the groove. TATLER – 169 Darlinghurst Rd (opp. Coke sign) Darlinghurst. 10pm till late – $10 door donation – See you on the dance floor! This entry was posted in Deep House Sydney and tagged disco, dj cman, dj juzzlikedat, DJ SAY WHUT, everyday people, funk, hip hop, mama feel good funk collective, RNB, soul, sydney events, TATLER. Bookmark the permalink. Don’t miss this peeps! Me and my boyz getting down to the afro sounds this Saturday @ Tatler in Darlinghurst.